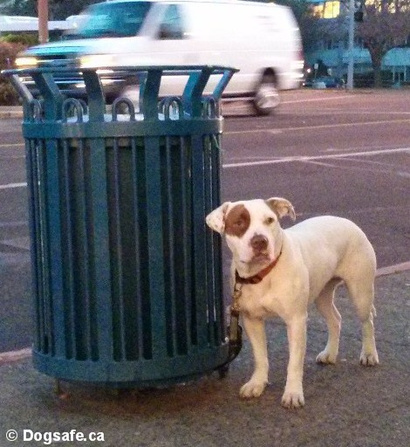 We help businesses Say "yes"
​We've all seen dogs tied to poles, alone and waiting. Some dogs may be at risk to be stolen or at risk to flee by chewing leashes and slipping collars. Others are displaying canine behaviour that indicates they are uncomfortable, nervous and stressed. Or seen the dogs left in warm cars. All situations leading to potential injuries requiring canine first aid. We're all about prevention! ​While out and about enjoying time with your dogs, or instead of leaving them in a warm car, wouldn't it be helpful to know right at the entrance of a business if they not only allow your dog inside, but welcome them with open arms? At Dogsafe, we aren't striving for mandated access to all businesses (that's a special right reserved for designated service dogs), we are striving to help individual business owners "say yes" to welcoming dogs by addressing their hesitations head-on. So we've created helpful (and free!) resources and tools to help them welcome dogs, including: signage for their doors, badges for their websites plus brochures they can give to customers that outlines appropriate and acceptable canine behaviour... and more resources to follow! One of the great pleasures is spending time outdoors with our dog and I always wonder, as we pass storefronts and shops, which businesses will welcome us during our walk. ​Many business owners have expressed their concerns about welcoming dogs in their premises and much of it relates to dog behaviour. We totally understand! So in response, we have designed a brochure that explains, without judgement, responsibilities for both dog owners and businesses. Share this with your customers and clients to ensure that dog-loving customers and clients remain responsibiity for their dog's behaviour. Share it with owners and managers of businesses that you'd love to see welcome dogs. View | Download | Dogs Welcome brochure PDF coming soon! Our Dogs Welcome display sign alerts potential dog-loving clients and customers that your business is not only dog-friendly but welcomes dogs because you've gone a step above and are commited to improving the safety and comfort of dogs. Download below and hey, why not laminate it for durability? Just a few dollars at your local stationery store or go online for Staples store in Canada or USA. Download and display your Dogs Welcome Business Recognition Certificate to show your customers and clients your dedication to their dogs' comfort and safety. Or contact us at info@dogsafe.ca if you'd like a customized Dogs Welcome Business Recognition certificate emailed to you. Although a rare event, if a customer injures or falls ill while in your business, we have 911 to call. Equally rare is if a dog becomes ill or injured while in or near your establishment but unfortunately, we don't have 911 as a resource. While you may not be responsible for the veterinary concern, it would be helpful and show due diligence and kindness to have contacts ready in advance. Our Dogs Welcome Business Recognition Program's Resources & Reporting Document is available as a guide for all your staff. A quick Google search will find the closest veterinary clinic, 24/7 emergency veterinary clinic, police contacts and animal welfare resourcesand animal control officers (in the event of a lost dog or dog altercation). Legally Not Permitted to Welcome Dogs But Still Want to Help? Some provinces and states currently regulate and restrict pets (not including designated service dogs) from entering specific businesses such as grocery stores and restaurants or organizations such as schools and public recreation centres. If you are the owner, operator or manager of one of these regulated businesses, we understand you cannot welcome dogs but if you care about dogs, you can still help! During the hot summer weather, why not download and display Dogsafe's free Will Your Dog Be Cool Enough poster at the entrance to your business or organization? Or why not laminate it for durability, just a few dollars at your local Staples store in Canada or USA. We thank you for helping us keep dogs safe! Full program and poster details available on our Heatstroke Awareness and Responder Network webpage. Download below and hey, why not laminate it for durability? Just a few dollars at your local stationery store or find a Staples store in Canada or USA. Creating and operating Dogsafe's free community projects takes hundreds and hundreds of heart-filled volunteer hours. 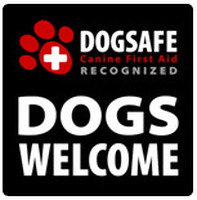 If you are a dog lover who sees the benefits and value of our community projects, please show your support by enrolling in a Dogsafe Canine First Aid course. ​Thank you!